Cost to frame a house. Framing cost. Framing a new house typically estimated at $11 - $22 per square foot for labor and materials. Custom made house framing including building multiple dormers, arches, 2 – 3 levels ceilings or complicated roof designs might increase the price up to 50% - 70% or even more. Standard 2,100 square feet house will cost $9,030 - $17,220 or $4.30 - $8.20 per sq. ft. for labor and crew of five should be able to complete the work and pass framing inspection within 2 – 3 weeks. Contractor typically will estimate garage area at 15 – 20% lower rate than living space. Building a high pitch roof will cost more for labor in comparison with prefabricated roof trusses installation, but saving will cover expenses for ordering and delivering the trusses and overall expenditure will be nearly equal. Structural insulated panels (SIPS) will be a few times less expensive to install for labor. Estimating the total cost conventional wood framed wall will be initially slightly cheaper, but SIPS panels will have some benefits and might save you in a long run. 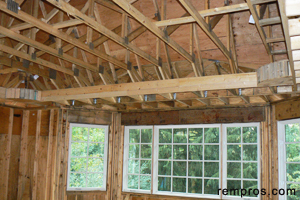 Framing interior walls with metal studs do not affect labor cost much. For experienced steel framer it will take nearly the same time to put a wall using 25–gauge galvanized steel studs as for carpenter build a wall with wooded 2 x 4s. Cost of materials will depend on house design and very often even in the same area similar in size houses will vary in prices per square foot because of different house plans. Using 2 x 6 instead of 2 x 4 while building walls, higher ceilings meaning longer studs or different types of floor joists will impact the material cost. Expenses for lumber and all supplementary wood framing components including nails, joist hangers, liquid nail adhesive, Tyvek will be prices at $5.5 - $14 per square foot or $9,900 - $25,200 for 1,800 sq. ft. house. Pricing faming work per square foot will work only on a new construction or building home additions. Contractor will give exact estimate only after analyzing house plan and calculating labor hours and material expenses. Per hour rates will vary and depend on a location at the first place. Changing in plan after work begins might lead to increasing the cost. There is no such thing as charge per square foot to frame a bathroom or bedroom while remodeling a house. This type of work will be estimated based on hourly rate of a carpenter and will vary significantly depending on what will be involved. How much does it cost to frame a basement? Carpenter will charge $700 - $800 for building walls using wood 2 x 4 studs in 850 square feet basement. Additional few hundred will be charged for framing around HVAC ducts or other pipes which might run lower than basement ceiling joists. Depending on total number of rooms, material expenses might vary from $950 to $1,900. How much did you pay for framing a house?